Martorell, 18/05/2016. – A man opens a rear passenger door of a car. Then he closes it. He listens to the sound it makes. He opens and closes it again, and repeats the operation two more times. When he’s satisfied, he makes a note in his digital tablet. In the meantime, there’s a woman sitting in the driver seat. She switches on the dipped beams and gets out of the car. She walks to the front and inspects the headlight. She too makes a note in her tablet. Then she gets back in the car and turns on the high beams. She gets out again and reinspects the light before making some more notes. These are just a few of the actions carried out by the participants in a Product Clinic, who are potential customers that make an assessment of the interior and exterior of a model that is in its development phase two years prior to its launch. 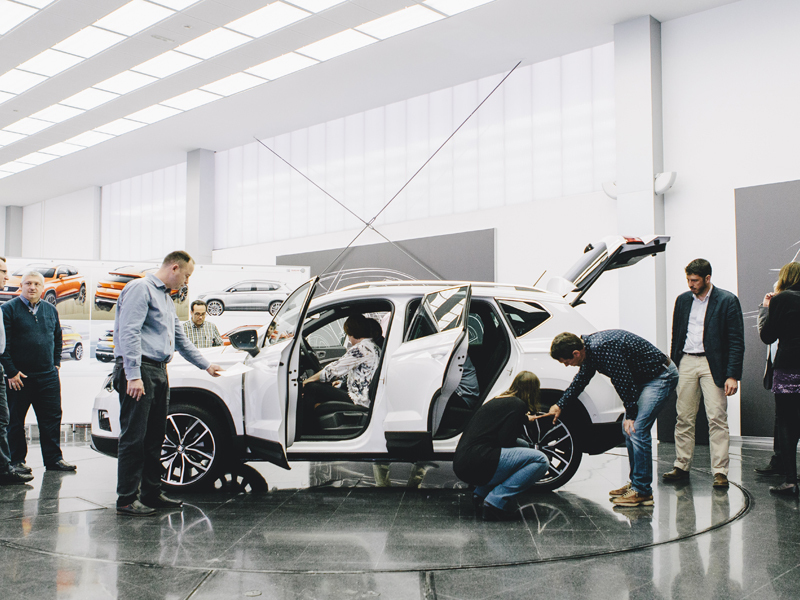 The purpose of the Clinic is to “identify the aspects that can be improved at a stage when we still have time to introduce some modifications”, explains Enrique Pastor, who is responsible for Product Strategy and market Research at SEAT. Between 300 and 500 people participate in the Clinics, who are divided into small groups. Some of them pay special attention to textures: “it feels soft”, says a woman who is running her hands over the steering wheel. Sitting beside her is a man who is sniffing the leather upholstery to rate how it smells. Another participant is in the back seat to assess how much legroom there is while a fourth is feeling the consistency of the seat cushions. Yet a fifth is at the rear of the car to check out the boot capacity: “it’s spacious”, he murmurs to himself. All the participants walk around and continuously check off parts of the survey on their tablet, scrutinising the car like experts. Three Clinics are performed during the three years prior to a new model launch. The first tests the viability of the concept; the second focuses on the product and the final one deals basically with its commercial positioning. Every clinic is enormously beneficial, as in several cases modification were made on a model as a result of the observations made by potential customers. For example, Enrique Pastor explains that: “On one model that we’re going to launch soon it was discovered that the driving position was too low and the necessary measures were taken to raise it”. He went on to say that “if the final results were extremely poor a model launch could get shelved”. However, he is quick to point out “that has never happened” at SEAT.